Selenium [Total or Se(VI)] Analysis Cartridge | OndaVia, Inc. 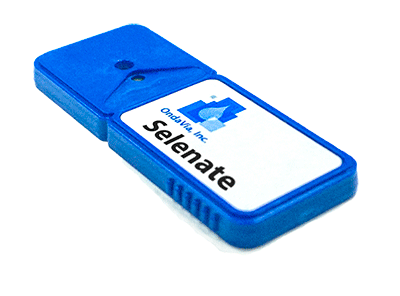 The OndaVia Analysis System with the Selenium Analysis Cartridge provides a fast, easy selenum measurement. The bench-top instrument consumes single-use, disposable analysis cartridges that provide a fast, easy-to-understand measurement of selenium levels in water. The method is specific to the Se6+ ion, enabling differentiation from the selenite (Se+4) and metallic selenium ionization states that colorimetric tests measure. With the addition of a simple oxidation step, you can determine total selenium content. Whether used to measure treatment system performance, to monitor flue-gas desulfurization effluent, or as part of a site survey, an OndaVia Analysis System provides fast, easy-to-understand selenium measurements. In contrast to the alternative of laboratory analysis, an OndaVia system gives you the on-site results needed for an immediate response. Range: 1- to 1000-ppb Cartridges are provided ten (10) per box.